I had been looking forward to this tutorial with Judit as she was present during my presentation about my practice. I also knew that she was a curator particularly interested in performance so any insight or guidance could prove to be valuable. After discussing with Judit my recent explorations after my conversations with James, she raised a point that I had been questioning myself. Whilst it is interesting to look at my work from a different angle, is this really what i need to do? When anyone looks at my work they are looking at it subjectively through their eyes and with their interests in mind. For example, naturally James was looking at my work with his research and practice in mind. I have, over the past few months, because of my degree show and also the exhibition at FloatArt, discussed my work many many times. I realise that I have probably spent more time looking at it from outside as a viewer than I have as an artist who is pushing concepts and ideas forward. What I have done is engaged in so many conversations about my work, that whilst it can be valuable- what it has done is caused confusion in my mind. What are my thoughts and what are the thoughts of the other half of the conversation? What do I think without the pollution of other people’s thoughts? This may sound negative with regards to the people who have helped me to gain insight; but it has also meant that I have got so lost that the connection between me and my concepts has got tangled up in a mess of ‘possible readings’. I need to find my thread and pick it back up. As soon as Judit made this point it seemed crystal clear why I had been feeling so lost! Also, by me chasing this anthropological research, whilst it is interesting- it wasn’t helping me to detangle my thoughts. What are the key elements to my work? What aspects are so important that if they were removed, the work would cease to be mine? What can my work not live without? Really look at my work. Don’t focus so much on the theoretical texts that I have been looking at. Instead of looking at them look at my work. Reconnect. 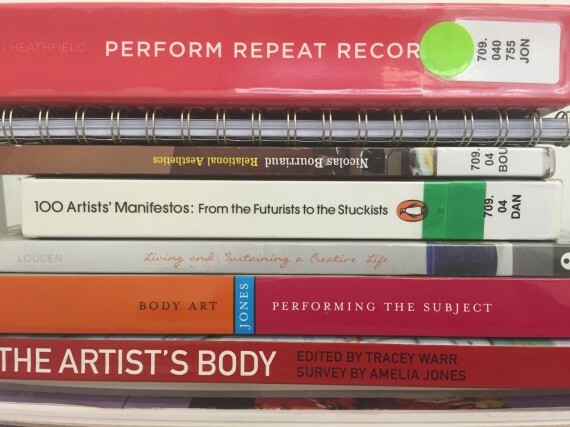 To help find the elements of my work that truly excite / engage me use the book ‘The Artist’s Body’ by Tracey Warr et al. Go through the book and really look at the imagery without paying attention to what has been written or even what section of the book the image belongs to in the first instance. Pick out the works that I really connect with. What is it in the image that really interests me in relation to my work? Make a note of the artist, title, what it is about the image that interests / excites me, (make some brief notes).Do some research on the artist and other works. Once I have done this, (and only after) it will be interesting to look at the sections from which my interests have come from in order to understand what are the ideas that really drive my work. Is it the gendered body? The body’s limits? Absent body and making it visible. So….use The Artist’s Body to understand the historical context for my work, but…. Judit also recommended visiting Richard Saltoun Gallery to look at the current exhibition Body As Language. Women and Performance. I was in fact lucky enough to be in London during the private view, so I have already seen this exhibition. I found the exhibition to incredibly inspiring. To see the body used and presented in a variety of ways fascinated me. It was interesting to me that despite there being a range of works from the 1970’s alongside more current works- nothing seemed dated to me. The issues that were being discussed through the works seem as relevant to me now as they were back in the 1970’s. Viewing more current works was exciting for me- for some reason it seemed to be a comfort to me; that my interests and explorations are still relevant. 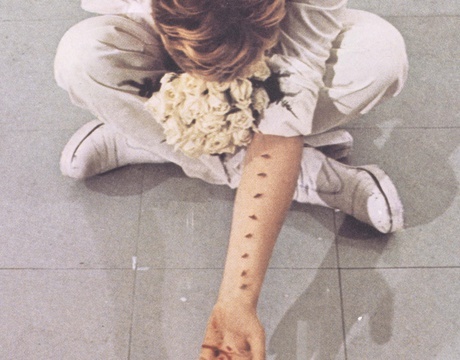 I found the work of Silvia Giambrone to be particularly powerful. Maybe it was because it felt familiar to me to be stitching the skin, but this was something else. The fact that a man was doing the stitching, that surgical stitches were used. That a collar that seemed so traditional was being used in a very contemporary practice. This all opened up a fascinating dialogue for me. I suppose what I need to do is take this interest further and research these artists and works with my work in mind, (as Judit suggested). Richard Saltoun Gallery was a new experience for me- I had never visited before- but as the gallery specialises in performance art with a particular interest in the female body, it is a gallery I will be watching closely to see what is being shown. I also need to look into 2 research projects Judit was involved in. ‘Milky Way You Will Hear Me Call’. Look at Neitzche- ‘Disposers of the Body’. As well as trying pin down the key concepts behind my practice I also need to give consideration and look into how i will place myself as and artist and also my practice in the future. Where will be the appropriate places to be showing my work? How will I connect with and expand on my network of peers? I feel a lot more positive in moving forward after speaking to Judit. I feel that I have clarity in knowing how to move forward in my attempts to get unstuck. I am also aware as to why I became stuck in the first place- which is incredibly valuable to me. I feel like as I have specific direction with regards to the type of research I have to do to move forward, and so don’t feel quite so anxious about my lack of ‘making’. Judit encouraged me to not think of my research as making but to do whatever it takes to help me connect with my thoughts- so whether that is to read, walk, photograph, work over found images, paint, draw etc. Then just do it!! Most importantly I need to fill my space with imagery that inspires and imagery of my own work. By being around it and looking at it, I will find that connection. With James’ suggestions in mind I decided to begin to look at other cultures; particularly reliquaries, power figures and memory crocks. 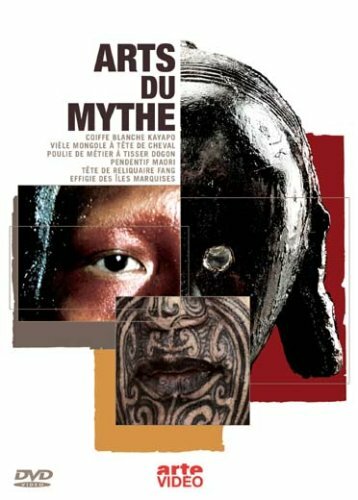 My first port of call would be to watch the series, ‘Art of Myths’ directed by Philippe Truffault and Ludovic Segarra, 2007. The First episode was about the White Kayopo Headdress. 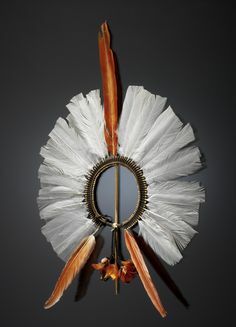 I found it incredibly fascinating to hear about the story behind the White Kayopo Headdress, it’s origins and what it means to the Kayopo people. Reflecting on the episode I tried to dissect what was of particular interest in relation to me and my practise. Firstly, I think the aspect that seems to impact me most is both the method of selecting and also use of Kayopo’s materials. For example, feathers are not selected for their functional qualities- they are used for the meanings behind them; What they symbolise within the Kayopo historical context. The bird in this culture is of particular importance due to it’s physical qualities. A bird, such as the Harpy Eagle, (where the white feathers of the White Headdress come from) is able to see from great heights, is able to fly far and fast. They also believe it to be the only being on this planet to know how to travel from this world to the next in death without being captured by the spider; another admirable quality that the Kayopo admire. The qualities of the eagle are qualities that the Kayopo wish to possess. When a Shaman wishes to see far beyond this world he turns into an animal of his choosing- it is often a bird such as an eagle due to these qualities. 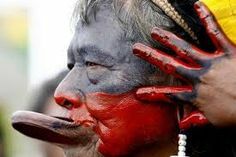 The Kayopo people use feathers also to express facets of their identity. It becomes a visual reading of their ‘self’. There are 3 colours of importance to the Kayopo. Black. A social colour representing the world the way it should be. It is the ‘normal’ colour. Red. The colour of vitality and strength. Usually applied to the body’s extremities. The ones in touch with the outside world which need extra vitality. White. The colour of the spirits. The importance of the relevance of the materials is something that I can relate to. The materials and colours used by the Kayopo are symbolic or representation for something in their belief system. I wonder, is the symbolic aspect of the materials I use an important factor within my work? I suppose the concepts that they communicate and symbolise are- or I would have used thread to stitch my hand opposed to hair. Is this use of material a key factor within my practise? Whilst I am finding looking at these anthropological concepts incredibly interesting, I recognise that deep within I am slightly worried of the work that may grow out of it. This sounds ridiculous to me as I type, (!) but if I am truthful- it is true. I don’t want to end up just replicating other cultures’ practises. To create tribal looking figures to me would be wrong. I would be copying their culture which would not seem to hold integrity to me and my experiences on this planet! Do I really need to replicate to admire? Does my work have to copy if it is informed by outside influences? Of course it doesn’t; and it shouldn’t be worrying me how my research will materialise- but I do worry! Maybe it is just down to my current insecurity- either way I am hoping that this doubt will disappear! I later looked at ‘Five Years of Toe Nail Clippings’ by David Shrigley which calmed my thinking. I instantly connected that his use of materials would reference reliquaries etc, but doesn’t imitate. 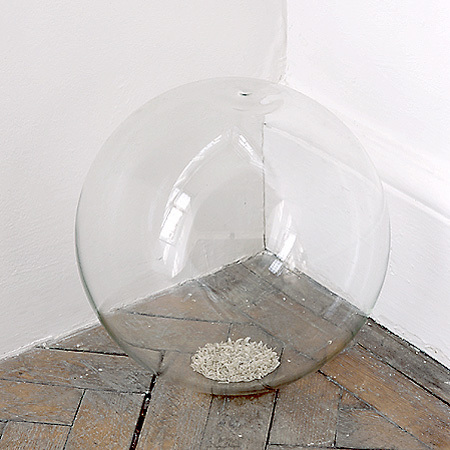 I love the simplistic ephemeral quietness to this piece that really seems to communicate a stillness- yet juxtaposed to that stillness is 5 years of the artist’s body/ toe nails contained within- referencing a contained, marked or noticed passing of time. The glass seems a precious, fragile vessel; yet the fact that toe nails from years ago are still present and indistinguishable from the rest suggests that maybe our physical self is not as completely temporary or fragile as we often think. Giving consideration to Picasso’s fears of uses of the remains of our material bodies- Shrigley’s work takes on another layer of complexity. I wonder- when do these layers stop when looking at work? Is that not what I am doing- just looking at other facets of my work, rather than examining the concepts behind the original explorations. Am I just getting more confused!?! The past ten days have passed in a blur! Adjusting to my new routine of 120 mile a day commute, getting to know my new environment at CSAD and trying to find my feet with my practise has meant that whilst I have been scribbling away in my journal frantically- I haven’t managed to keep my blog up to date. Maybe this is a reflection of the internal uncertainty I am feeling in my practise? But, I am feeling much more stable in my routine and so I hope that the connection between my practise, journal and blog will have a more correlated connection. I had been struggling to move forward and I was feeling a pressure to produce. Being in a new environment I felt that I needed to make my mark in a visual way. I decided to have a chat with James Green– one of our tutors. James has a string interest in cultural objects / artefacts such as masks and power objects. In the office I had been admiring a small part of his collection of power objects- I felt instantly drawn to them I have always been interested in other cultures and belief systems, particularly where objects are used as expression or practise of these beliefs- so to see James’ collection was wonderful. It was interesting to me that when looking at my hand stitched work James had drawn a parallel between the action of me stitching my hand and the Nsiki power object I had been looking at in the office. 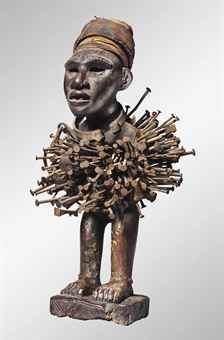 Thinking about the act of intentionally pushing a needle through my skin and the act of pushing a needle / pin through a power object such as an Nsiki sparked an interest in me. I had never considered looking at the work from this angle before. We then went on to discuss acts of self preservation and the power behind fingernails or hair when giving consideration to these types of practises. James told me how Picasso was incredibly paranoid about these practises and that he always had strict instructions for his hair dresser on how to destroy his hair after he had his hair cut. He was fearful that someone would collect it and use it to cause him harm. To me this brought my previous body of work, ‘Tracing the Liminal’ to the forefront of my mind. I could see the connection. As artists, that’s what we do. We look for new connections to explore…maybe this would be my way of moving forward. James and I discussed how when you move to a new space it is easy to fall into the feeling of the need to make your mark, yet he said it was okay to start off small and work from there. To give myself time to explore and research. Strangely I felt like I really did need permission to do this. I have always felt self conscious in communal spaces when working, about my lack of physical making. I tend to do lots of looking, reading, thinking and writing before I actually begin making- or doing. I feel excited about going on an anthropological exploration with my research, but I wonder how relevant it is….? Does it really matter? How relevant it is? It is tricky to allow myself to be free and explorative, whilst always keeping in the back of my mind that this course is only a year long. Yesterday myself and three other students presented our practises to the rest of the group and Judit Bodor and Mark Gubb. (Click here to see my website to see my previous works to give context for this post).I feel that I am at a cross-raods in my practise with regards to the work that I am making; due to my recent reconnection with my Hand Stitched work I am wondering how I can move forward. I am questioning whether I should take on the performative aspect and do a durational performance of the work. The reason I am considering this is that I feel that it is the main unresolved issue with it. For various reasons it didn’t happen during my degree but it was always the elephant in the room. But then again I don’t just want to replicate work that i have made previously. I suppose in a sense I am stuck, and feeling the pressure of being in a new space within which I feel I need to make my mark. My main hope for yesterday was to present my work to fresh eyes, and therefore get fresh feedback. Maybe they would see it from a new perspective and then in turn help me to through their feedback. Mark and Judit both raised interesting points. They both said that they thought it was interesting that I talk about performative aspects of my work and that I am using the body to explore various concepts- yet the body is rarely present in the work. On reflecting this seems obvious- but for some reason I didn’t seem to be aware of this. Or maybe I had been but had disconnected from the thought! Maybe this was the reason for my desire to do a performance of the work. But then again, is it really necessary? I think there is power behind the absence of the body and in previous works I feel that the visible action that has taken place, and the absence of the body has created a space for thought/ reflection. There can be a presence through absence. Judit raised a point that I have questioned and debated about over and over previously, but I don’t think I have succeeded in fully answering- mainly because it is so subjective. Where is the art? Is it the performance? The photo? The film? I think each medium communicates a different aspect of the work. I think that work-no matter what it is, becomes multi faceted when displayed through different mediums. Photography comes with it’s own context which with inform a work differently to experiencing a performance. Typically, photography is used alongside performance for documentation purposes- and originally that is how I was using photography; but on reflection and after yesterday’s discussions I realise that actually my photographs are not documentary. Whilst they do illustrate the process that has happened, through the enlargement of the image they have become something else. What I realise now is that I have actually been exploring how the change of medium / method of display can alter a work/ how it can change the reading of the work. Another interesting point raised by one of the other students was the fact that ritualistic behaviour is a common theme in my practise. Whilst I had previously considered this it is good to have it brought to the front of my mind. When moving forward maybe this can be something I consider. One of the bonuses to showing at FloatArt was being invited to attend seminars with guest speaker Jeremy Hull. The intention of these seminars was to discuss the process of moving from art school graduate into ‘the real world’ as a practising artist. What are the things standing in the way of us achieving our goals? What are our fears for the future? The fears and obstacles suggested by the group were all the things you would typically expect……. What if nobody likes my work? How can I financially support my practise? How do I stay motivated enough to keep making work? Access to materials and workshops. Do I have / how do I make the right connections? IE: Galleries, other artists for crits and support, buyers, curators etc. Another question Jeremy raised was how much control do you feel you have over the path that your career will take? The general consensus between the group was very little. We then realised that this was actually a positive thing. If we have very little control then that means that the future is laced with uncertainty. If the future is full of uncertainty, then anything can happen! This is actually really exciting. Going back to the long list of fears and obstacles, after discussing them we realised that none of them were actually real / concrete. They were all self imposed. They were imposed by us through our fear of the unknown. The key was to realise that these thoughts have an impact inwardly, just as our work has an impact outwardly. The dialogue we have with ourselves is actually really powerful, and so every doubt that we repeat to our selves, such as nobody will want to buy my work, means that we are blocking our own paths / opportunities by believing our inner critic. So, how do we move forward with our practise and squash all of these obstacles and fears? Communication. Through communication we can take ownership and generate opportunities, build networks, get our work shown, sell our work, connect to other artists. This is why conversation is such a powerful tool. To be able to communicate your ideas is invaluable. As artists we are communicators- and as Jeremy stated- we communicate in ways that other people couldn’t imagine. That is what makes art. Harnessing these skills and using them to drive each area of our lives forward means that we are taking ownership and being proactive in driving our practise forward. To end, I will leave something wonderful that Jeremy said to us. Artists are gifts. We are all gifts to the world. We make work that gives on so many levels. People walk into that gallery, see your work and take a part of it home with them. They experience it and are changed for it. It gives them something on a deeper level. And so we are gifts to the world. It does not entitle us to anything, but we should know the power we have through our ability to communicate and share our ideas.